OPI has added two new hues to its Designer Series by OPI collection. The new shades are a Polished Quartz formula and were inspired by semi-precious stones. They are glittery, glamourous and look gorgeous on fingers and toes! DS Tourmaline and DS Titanium feature a semi-matte finish and stand out with their three-dimensional sparkle. 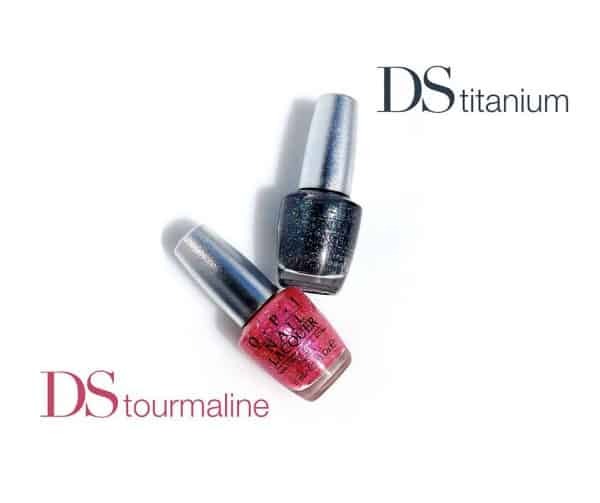 DS Tourmaline is a pretty rose colour and DS Titanium is a dark silver. Both can be worn alone for a semi-matte look or with DS Top Coat to give them a shiny finish. I love how they instantly change a plain outfit into something fun. It’s similar to wearing jewelry. You can wear a plain t-shirt and jeans and add a little bit of sparkly jewelry and turn the outfit into something totally fun and new. It’s the same way with nail polish. I always feel a little more confident when I’m glammed up and looking my best. I adore the DS Titanium! 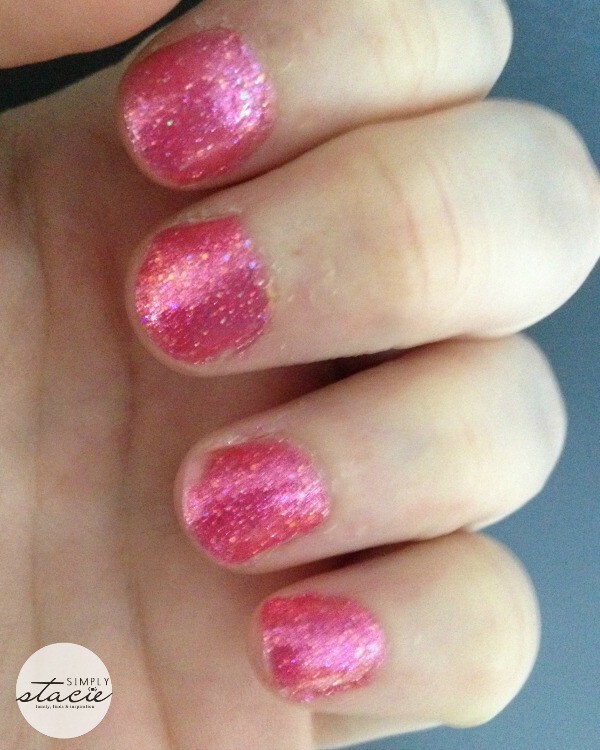 It looks dark pink on my nails with two coats and makes my nails sparkle especially when they catch the light. I wear it semi-matte and will be trying it with a the top coat to see how it compares. My daughter says it looks like pink diamonds. Like the other Designer Series by OPI shades, these two also feature OPI’s exclusive ProWide Brush for easy application. Both shades are now available (beginning on September 3, 2014) at professional spas and salons across the country. They have a SRP of $14.95 CAN. Connect with OPI on Facebook, Twitter, YouTube and Pinterest. I only wear nail polish on my toes in the summer. With my job we are not allowed to wear nail polish or have fake nails. OPI is constantly coming up with new colours and collections. Not sure I have the hands for a sparkly look, but would definitely wear these on my toes in the summer. Thanks for sharing. OPI has great colours. These would be fabulous for a night out. I have never tried OPI. I just canceled my Julep Maven account. I liked the vibrant colors but the polish didn’t last long. I love OPI and I think these would be a perfect gift for a teen. I don’t usually go for a darker type of shade like the Tourmaline…but I really like that shade with the sparkly effects. Opi means great colours,, great names, always coming up with new ideas. Love OPI polishes and they are always coming up a great new ones! Love the DS Titanium! 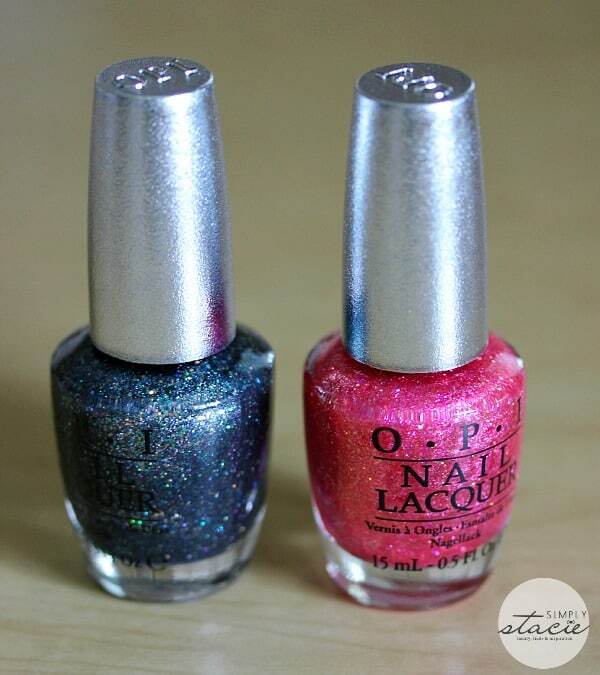 I like Opi Nail polish, and these two new colors coming out are beautiful! I would love to try these and see how they look on me!! OPI is my favorite nail polish and those two new colors are now my new favorite colors! I have always been shy about putting any bold colour on my toes until I found Bogota by OPI. Now when I go in to have a pedicure I always bring my own nail colour, Bogota, so I will be confident that I will like the outcome. I love OPI polishes so I have to give these a go. I think I might go for DS Titanium because I love darker nails for the fall and winter! I can’t wait to see how this looks in real life! I am going to run out and buy the titanium one its my fav color. Sparkly, fun, and a nice finish. I really like the pink on you. This would really be great for any age depending upon the look you are going for. These colors are beautiful I love them. I love the shine and sparkle of these colours. So glam! Very pretty nail polish colors. I really like the Opi line of polishes. I love these colors – great for a party! I love nail polish. Great colors. I love OPI’s colors. The tourmaline one is really pretty.